If Wei Lan (pseudonym) hadn’t returned to China in December for the winter holiday, today he would be sitting in a classroom at the University of Illinois Urbana-Champaign, continuing his studies as a doctoral student. For the last three months, he has been anxiously awaiting the student visa that will allow him to return to his study. Since early March, many Chinese students who have not been able to return to the U.S. for the most recent semester have been organizing through a WeChat group in hopes of raising awareness of their plight. Many came back to China at the end of 2018 for winter vacation — but have since suffered through a long and opaque administrative process. Some of the groups quickly grew to have more than 100 members. Some students have already completed their undergraduate studies in China and were working on masters or doctoral degrees in engineering or the sciences in the U.S. Others are studying in the fields of artificial intelligence, aviation, or the material sciences. In May 2018, the Associated Press reported that the State Department was planning to shorten the validity length of student visas for Chinese students studying a masters or Ph.D. in robotics, aviation and high-end manufacturing. These areas have been particularly sensitive in recent years. A policy notice from China's State Council, issued in 2015, outlines the “Made in China 2025” plan to upgrade China's industrial sector, specifically aimed at improving machinery, aviation and intelligent manufacturing, among others. The shortened validly length meant that if students left the U.S., to return home or go to another country for any reason, they would have to apply for a new visa. China's Foreign Ministry slammed the move, with spokesperson Hua Chunying saying that China and the U.S. should facilitate “people-to-people exchanges” instead of “doing the opposite" at a regular press conference after the changes were announced. Of course, students can also choose to stay in the U.S., because foreigners’ legal residence period is determined by the U.S. Citizenship and Immigration Services. In short, a student visa is just a permit for entering and leaving the U.S.
“My major in the U.S. is computer science. It’s related to AI, but what I’m doing is for civil use, I don’t think it’s anything sensitive,” complained Wang Nan (pseudonym), a doctoral student who has been waiting for his visa since December. On March 7, branches of the Chinese Students and Scholars Association (CSSA) at the University of Illinois-Urbana Champaign, University of California-Berkeley, and Cornell University published an open letter to gather support for a petition about the issue. According to the State Department website, visas have two statuses: approved or denied. However, the visa office can implement “administrative processing” for visa applicants who may be denied, a process with no time limit. With the tightening of student, work, and business visas, more applicants have required extra investigations, which has extended the normal administrative processing period. “Before I came home, I had heard that U.S. visas were getting more strict, but I didn’t realize it would be this terrible,” Wei said. In the U.S., he was studying condensed matter physics in theoretical research — but the knowledge can also be applied to quantum computing. In 2017, his visa application underwent administrative processing, but it was approved in one month. It was valid for only one year. In June 2018, at a Congressional hearing on the Chinese student visa issue, Deputy Assistant Secretary for Visa Services Edward Ramotowski confirmed that embassies and consulates had received special instructions to conduct additional investigations into Chinese students studying subjects in “sensitive areas.” He explained that the regulations were applicable to students studying for masters, doctoral, and post-doctoral degrees. The “risk” for undergraduate students was not as high due to the more basic nature of their degrees. Ramotowski said at the hearing that the new regulations were in accordance with President Trump’s National Security Strategy announced in December 2017 and would prevent leaks of sensitive and patented technologies. Ramotowski also acknowledged that excessive implementation could negatively impact America’s ability to attract talent and the benefits foreign students bring. Bill Priestap, assistant director of the FBI’s Counterintelligence Division, revealed at the hearing that in 2017, “international academics studying at U.S. colleges and universities contributed $36.9 billion to the U.S. economy and supported over 450,000 jobs.” He added that three U.S. jobs were created for every seven academics enrolled. According to statistics from the U.S. Department of Homeland Security, China is the largest source of international students to American universities — of the 1.2 million foreign students in the U.S., 377,000 are from China. 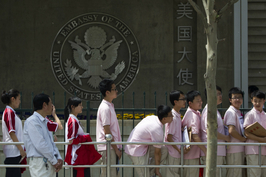 The vast majority of the visa applicants interviewed by Caixin said that they had tried multiple different channels to inquire about their visa application status, including through sending endless emails to the American embassy and the State Department, even calling U.S. Congressional representatives, universities, or other organizations for help — all to no avail. “The school can only let us extend our study period, but they can’t help us speak with the U.S. government. Through the whole process, there’s no one who can intervene,” Wang said. 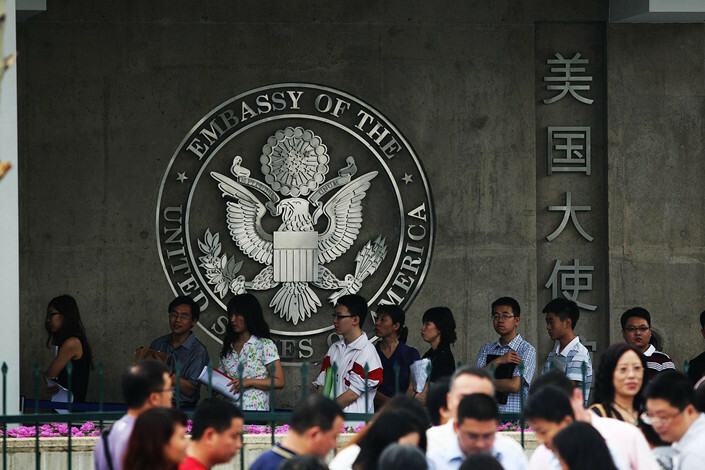 In response to questions from Caixin, a spokesperson from the U.S. Embassy in Beijing said that visa applications are taken on a case-by-case basis, and it is up to the visa officer to determine whether a visa applicant’s situation meets the requirements laid out by U.S. law. Official statistics show that the U.S. is issuing fewer work visas than it once did. According to statistics from the U.S. Citizen and Immigration Services, in 2015, 96% of applications were approved. In 2018, this shrunk to 85%. During the approval process, the government has also required applicants to submit additional materials, thus lengthening the processing time. 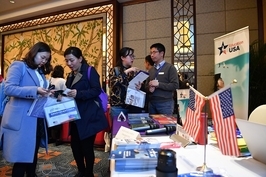 Director of Penn Wharton China Center Z. John Zhang told Caixin that this could make it hard for foreign students to find work in the U.S. and reduce the motivation for foreign students to come to America for an MBA. The new visa policies have also begun to affect regular academic exchanges. On March 7, Bao Yungang, director of the Chinese Academy of Science’s Center for Advanced Computer Systems, posted on WeChat he and his colleague would miss a planning meeting for program chairs of the International Symposium on Computer Architecture to be held in Arizona in June — because the U.S. government was still processing their visa applications. Bao told Caixin that especially for those in the fields of chips and supercomputing, America’s visa policies have gotten increasingly strict. Since 2008, each of his visa applications have been subjected to administrative processing and he has not been able to obtain a 10-year business trip visa. Bao also felt that the processing time has gotten longer. Students from the Chinese Academy of Sciences who have applied for U.S. visas are usually directly accepted, and now they are often first put under administrative processing, he said. He worries that this could impact academic exchanges between China and the U.S.
On the other hand, other well-known foreign scholars are also experiencing similar situations, showing that the visa restrictions are not just limited to China. Adi Shamir, a world-renowned cryptographer and professor at the Weizmann Institute in Israel, recently had his visa application denied and was unable to attend a security conference in San Francisco in early March. His application had been placed under investigation over two months earlier. For Chinese students who are still waiting for their visas, the potential cost of giving up their studies in America is too great. Many of them are still paying rent on housing and have already paid tuition. Some of the students in the WeChat group have received their visas, but many more are stuck waiting, without any idea of how long the wait for their visa will continue or how to speed up the process. “If I don’t get my visa, I could consider transferring to a school in another country or ask my family members to help me find a job. I haven’t thought about it yet,” Wang said. But even after over 100 days of anxiety, his first choice is still to continue waiting.